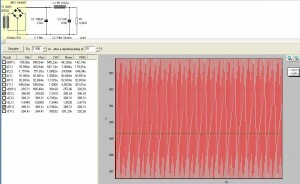 I came across a very interesting simulation problem just recently, one concerning the Duncan PSU Designer, in the context of designing a simple CLC filter. (hmmm … is it really a CLC filter?). What is better: a good choke or a bad choke ? A choke with a high value of Q-uality, or one with a low value of Q-uality ? a). a choice of two possible transformers: A “stiff” 300 V AC transformer, with R_DC = 6 ohms, and a “soft” 300 V AC transformer, with R_DC = 60 ohms. b). An appropriately rated rectifier bridge. c). C1 = 100 uF , rated for a voltage ( hmmm …. this is the biG “issue” ). d). A good Q-uality choke and a bad Q-uality choke, say, 2H / 10 ohms and 2H / 60 ohms. e). A battery of C2, …. Cn of a total of around 1000 uF / 450V. What is better, a “good” choke, or a “bad” choke ? 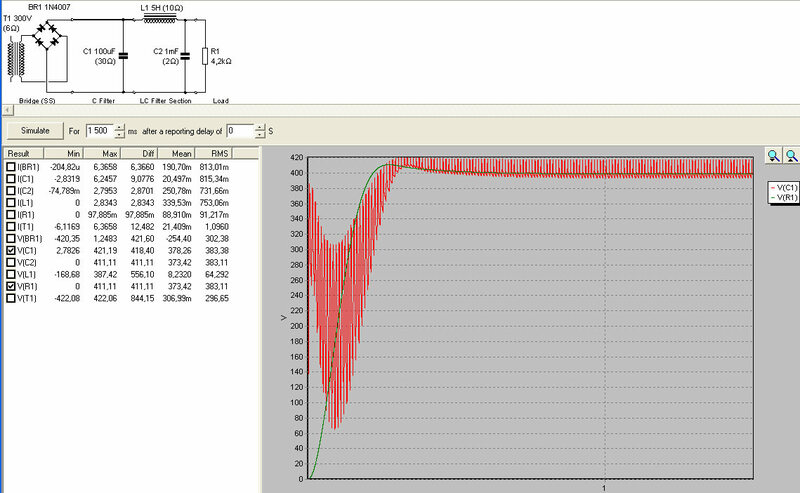 Lets just say that you are targeting at a load that is a tube pulling 100 mA of current. Further, lets assume that any output voltage, DC, in the whereabouts of 400 to 430 V is good enough. 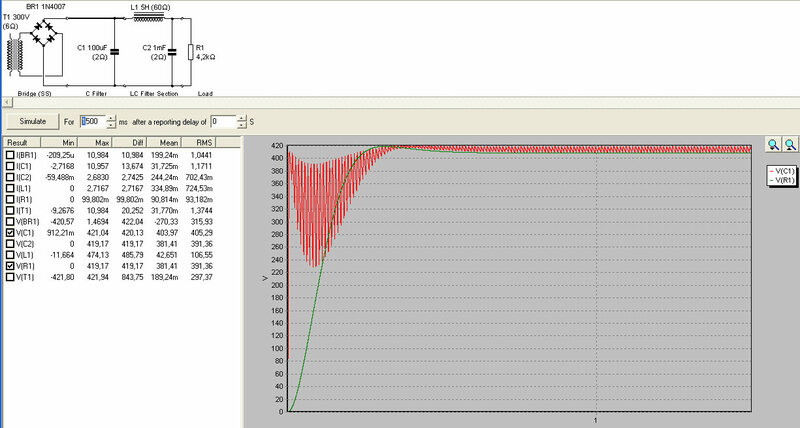 So, for the sake of the simulation, assume R_load ~= 4200 ohms. Let us assume that your capacitors are rated for 450 VDC. Do not exceed that limit. Also assume, that the Tubes can withstand a maximum of 550 V DC, short term. Well, How are your simulations doing ? Did I just say that the “good” choke is good ? This is a different view: a timeline snapshot, straight after switch-on, but of some different components. The stiff transformer (6 ohms) albeit, this time, with the “BAD” choke. 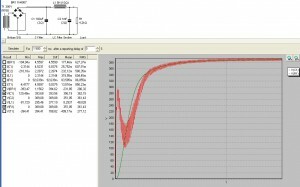 Do you see that red voltage on your C1 capacitor ? How come is it so well behaved ? How come does the system stabilize in such a short time ? Both of your capacitors should survive this test. Did I just say that the “bad” choke is bad ? This is the Stiff transformer with “good” choke scenario, but after waiting 15 seconds for the system to stabilize itself. 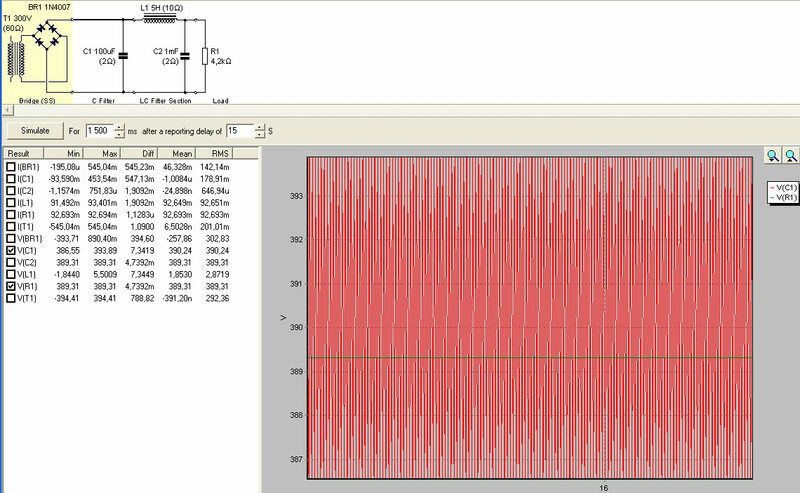 Do you see that 5,45 milivolts of “Diff” voltage on R1 ? .. – a fairly small value of ripple (up to the explosion of the capacitors ). This is the Stiff transformer with “bad” choke scenario, but after waiting 15 seconds for the system to stabilize itself. 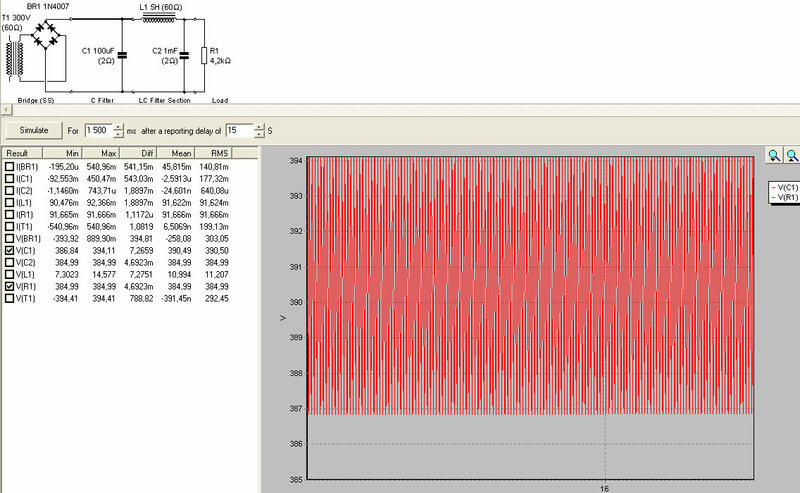 Do you see that 5,39 milivolts of “Diff” voltage on R1 ? .. – a slightly lower value than before. In the case of a “stiff” transformer, with thick wires, huge dimensions and low internal winding resistance, actually the better of the two chokes is the “bad” one, with higher internal DC resistance. Why ? Because it does not “overshoot” with the initial settling voltage, and it does not reach voltage extremes that could blow up your capacitors, or maybe even arc over your tube. How is this possible ? As in any L + C type of circuit, if you are playing around with L + C ,you get exactly that: an LC resonant circuit. The initial switching on of the power is like a heavy impluse of excitation. This may cause oscillations. If the “quality” of this circuit is … “too good”, then the circuit “rings”. Overshoots. It can even blow up your capacitors. So what does exactly happen when you use the “bad” choke ? Simple. 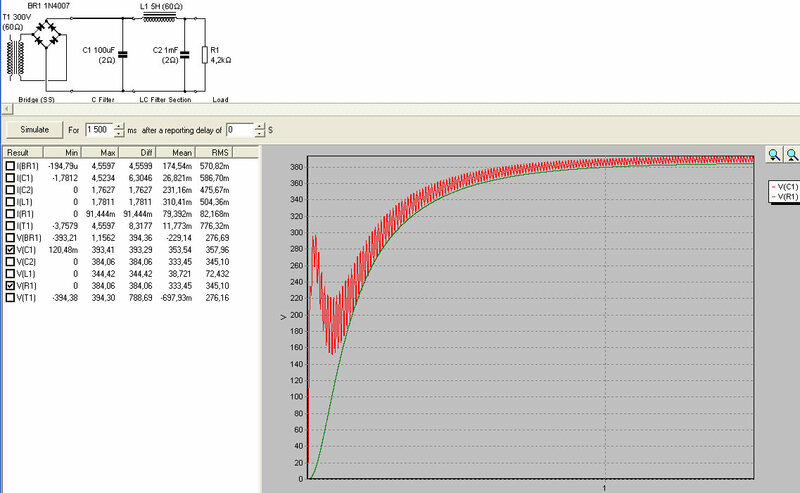 Instead of a “pure” LC .. you have more of an LRC … also a resonant circuit, but this time, with much more DAMPING. 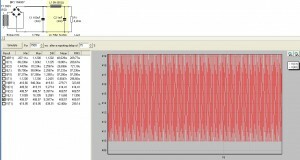 The damping withholds the system from falling into too excessive oscillations. Indeed, on picture no. 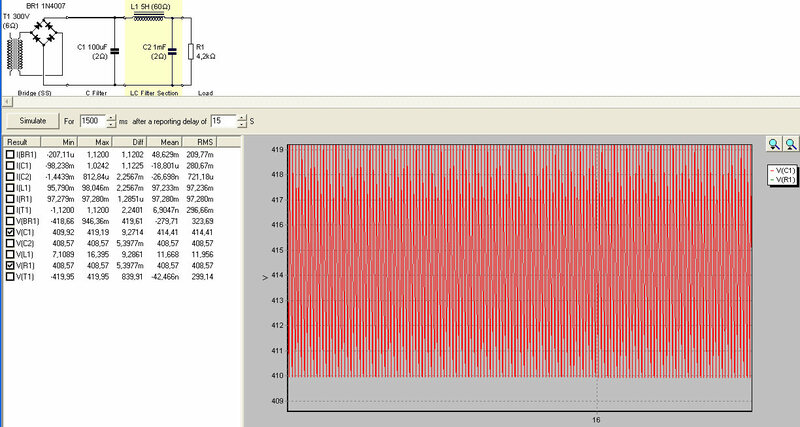 2. you can still see them, those oscillations. But in this case, they are much milder and they to not OVERSHOOT above the hard limit of 450V DC, at which your caps could / would / should blow up. My reasoning is as follows: if you are using a stiff transformer, then be careful to provide some damping into your resonant circuit, er …. 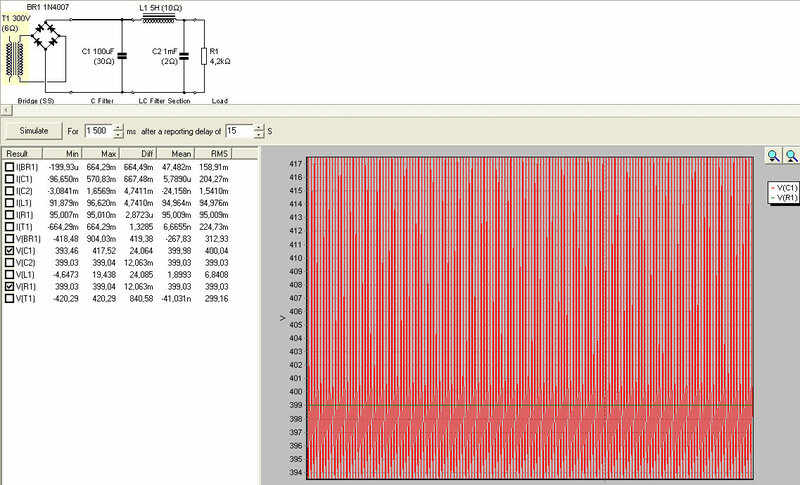 filter :) Be cautious about using too low R_DC chokes in such a configuration. OK, So, now, lets relax a bit. So what does actually happen, if we repeat the above scenario of photos, but this time with a “soft” transformer, with a winding resistance of say 10x higher as before, like 60 ohms ? No critical problems here. The “good” choke tends to oscillate a bit more than the one below, but actually, the system stabilizes just a tad quicker. No overshoots. A very safe configuration, from the capacitors point of view. The output voltage is sagging a bit, though. 389V. This is a natural consequence of the chokes R_DC within the series path from rectifier to the load. No critical problems here either. The “bad” choke tends to oscillate a bit less than the one above, and the system stabilizes just a bit slower. 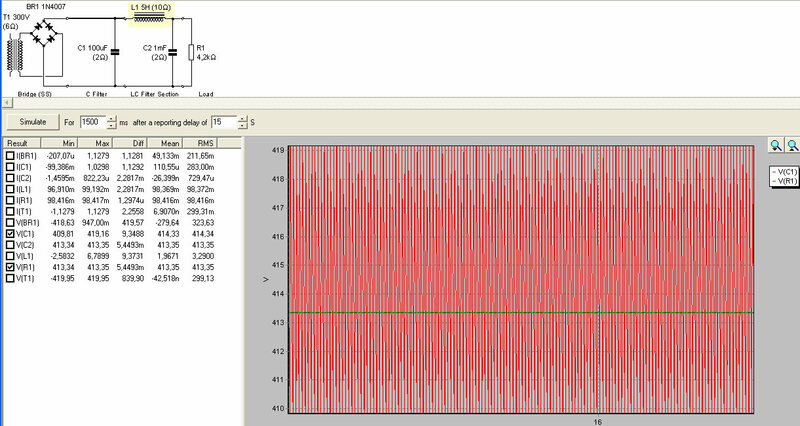 The output voltage is sagging even more, though: 384V. Once that the system is stable, we see that the version with the “good” choke, has a slightly higher value of ripple: 4,73 mV. The “bad” choke version has 4,69 mV of ripple, so again, slightly better system performance in this scenario. To recap: A soft transformer is exactly that: it is soft. It has an internal resistance so high, that even a good choke is … good enough. The damping from the “transformer” side is so huge, that even the extremist scenario, the highly explosive capacitors version as of picture one, is now but a humble and boring one, with a sagging voltage on the output, with no frills. It does not make sense to consider the “soft” transformer as a possible remedy to this interesting overshoot issue, though. 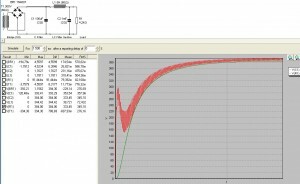 We do not want our voltages to sag to the beat of the music, don’t we ? Ok, so let us consider yet another idea. I do not believe my eyes ! No exploding capacitors here. Actually, we have a very mild overshoot, of some 10 or 20 Volts above target, but that is not critical, as it will not destroy anything. 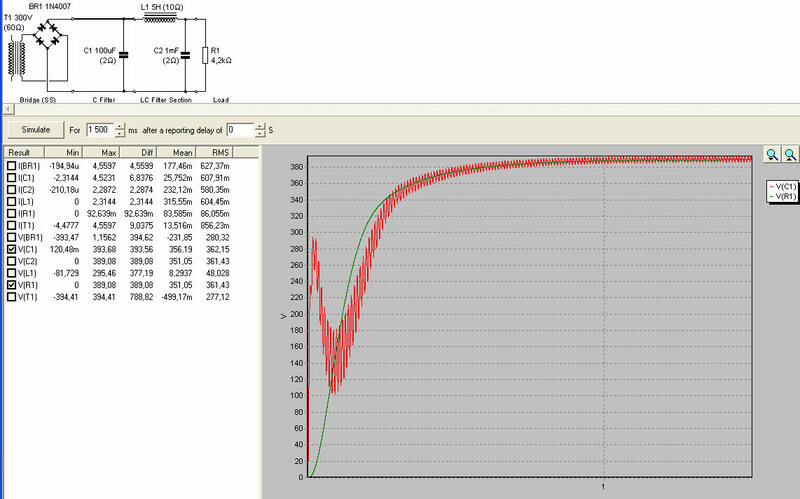 The target settles at 400V, which is actually quite good. As for the mild overshoot, It is well within and below the 450V DC maximum capacitor limit. 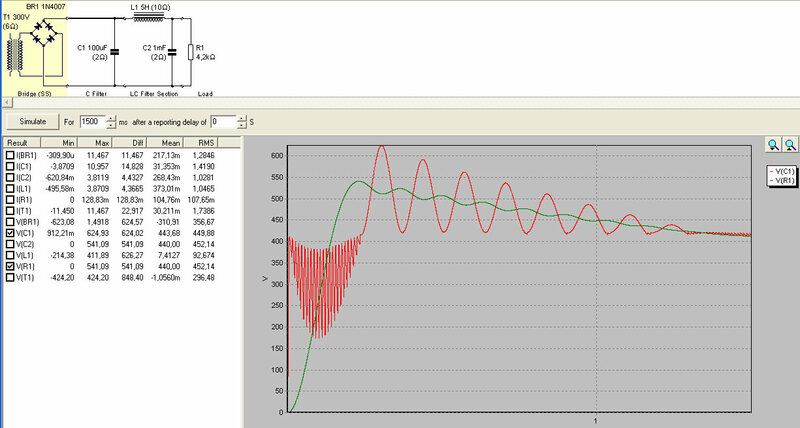 But look at how quickly this circuit “stabilizes” ! Very nice. But there is more. As the “serial” path is not burdened with any excessive “serial” resistance now, the “sag” of the output voltage is not so painful, as it could be. For instance, if we, say, had increased the current draw by two-fold. So,.. hmmm …. well …. Free lunch ? See? No free lunch here, unfortunately. The ripple, i.e. the “Diff” voltage on R1. It is now 12 mV. 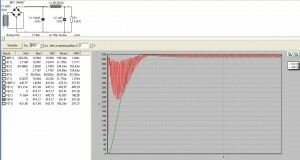 So it is actually a bit more than 2x higher as it was in the case of the “exploding” capacitors scenario. But the good news is that if we were now to exchange the load current from 100mA to twice that value, the amount of sag on the output will still be much much less than in the case of any “soft” transformer and/or “high DC-Resistance” choke scenario. And besides, within the idea as presented above - … nothing explodes. So, making a long story short: if you happen to have a too-good-a-transformer, and want to use it together with a better-than-it-should-be choke, it may be worth considering to introduce some additional damping, via additional R-esistance with the LC circuit. You can do so by either introducing the resistance in the series path, en route to the load, a series resistance of/with the choke, or a shunt resistance, by applying a series resistor with the C1 capacitor. Considering the trade-off, I think that I would go for the option b), i.e. 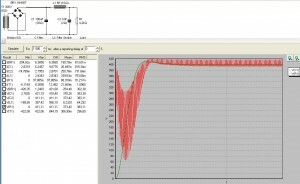 for the series resistor that increases the shunt ESR of the C1 capacitor. My heart would bleed about the increased ripple on the output, so most probably, I would go for yet another, separate, stiff choke, further down the line, or better still, maybe would make the stiff choke as an anti-phase multiple windings configuration, so that the ripple components from each of the two windings would fight against each other, and partially null each other out. But THAT – that is the subject of a totally diffferent (more recent) article.